SAN FRANCISCO — Few people realized it at the time, but the world shifted fundamentally a decade ago when Steve Jobs pulled the first iPhone from Apple's bag of technological tricks. "Every once in a while, a revolutionary product comes along that changes everything," Jobs declared as he paced across a San Francisco stage. It obviously wasn't an empty boast. We all know now that Jobs' "magical product" has reshaped culture, shaken up industries, put computers in billions of pockets and made it possible to do just about anything with a few taps on a screen. Besides its then 3.5-inch touch screen, the first iPhone featured a browser for on-the-go web surfing and built-in apps to check email and get directions. Apple has sold more than 1 billion iPhones since its debut, spawning millions of mobile applications and prodding other technology companies to make similar smartphones that have become like phantom limbs for many of us. We use iPhones and their copycats to instantly share video and pictures with friends and family from almost anywhere. We use them to figure out where we are going. We use them to find the best deals while shopping in stores and to pay for stuff at the checkout stand. We use the phones to a hail ride, to tune instruments, to monitor our health and help find our next jobs. Phones have gotten so smart that they even talk back to us via helpful digital concierges such as the iPhone's Siri and the recently introduced Assistant on Google's Pixel phone. "IPhone is an essential part of our customers' lives, and today more than ever it is redefining the way we communicate, entertain, work and live," Apple's current CEO, Tim Cook, boasted in a retrospective that the Cupertino, California, company posted on its website. The iPhone's revolutionary touch screen doomed the BlackBerry, another once-popular internet-connected phone. Mobile phones and their tablet cousins triggered a downturn in personal computer sales that is still unfolding. An estimated 219 million desktop and laptop computers shipped worldwide last year, down from 264 million in 2007, according to the research firm Gartner Inc. Meanwhile, nearly 1.9 billion mobile phones shipped last year, up from 1.15 billion in 2007. All told, Gartner estimates about 5 billion mobile phones are currently in use around the world compared to 1.3 billion PCs. The eroding popularity of PCs spurred shake-ups at powerful tech companies such as Microsoft, Intel, Hewlett-Packard and Dell, none of which adapted nimbly to the mobile world unleashed by the iPhone. Then-Microsoft's CEO Steve Ballmer scoffed at Apple's glass-and-metal gadget, telling USA Today in April 2007 that "there's no chance that the iPhone is going to get any significant market share. No chance." Microsoft wound up squandering the $7.6 billion that it spent to buy phone maker Nokia in a futile attempt to catch up to the iPhone. Ballmer stepped down as CEO three years ago and was replaced by Satya Nadella, who introduced versions of Microsoft's popular Office programs that worked on Apple's iPad — a tablet based on the iPhone. 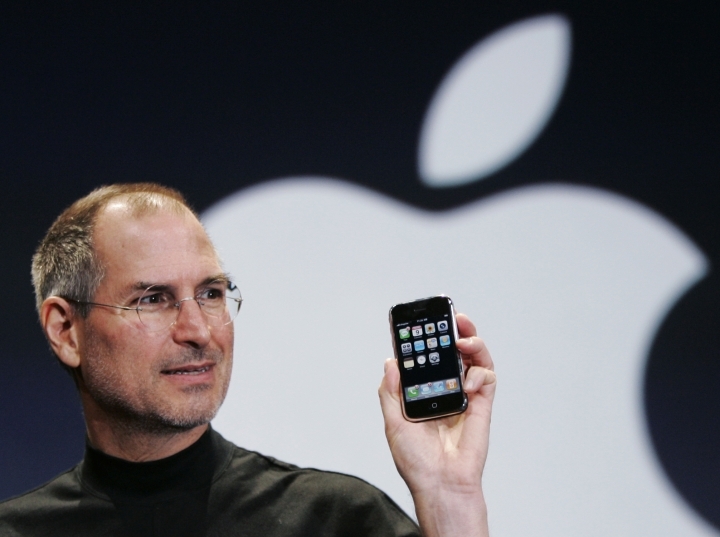 The iPhone's success helped make Jobs a revered figure for many, and one whose October 2011 death was mourned around the world. The device has established Apple as the world's most profitable company with earnings of $45.7 billion on sales of $216 billion during its latest fiscal year. (Prior to the iPhone's release, Apple posted an annual profit of $2 billion on sales of $19.3 billion.) Its stock-market value is hovering around $635 billion, thanks to a split-adjusted stock price that's risen by nearly a factor of 10 since the iPhone's debut. Lately, though, the iPhone appears to be losing some steam. People are keeping older models for longer before upgrading or switching over to competing phones that run on Google's Android software. Apple suffered its first-ever decline in iPhone sales in its last fiscal year, causing the company to miss its revenue projections and hitting Cook with a 15 percent pay cut . Most smartphones now run on Android, partly because Google gives away the software. That has helped iPhone rivals woo price conscious consumers, especially outside the U.S., with phones that are much cheaper than the iPhone, whose latest models now cost more than $649 to $849. In his statement, though, Cook promised the iPhone is "just getting started. The best is yet to come."